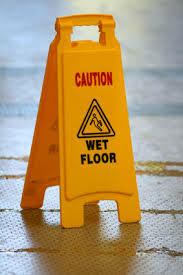 Yes, it is that time of year again when we see an increase in slips and falls as a result of the weather. So, what can we do to help prevent these potential serious injuries? There are several things we can do. However, the first and probably most important thing we need to do is be prepared. It’s time to locate our shovels, ice melt and other items we will need to keep our walking surfaces clear of ice and snow. It is important that these items are readily available before the first freezing event. We must also make sure that we have floor mats available and ready for use at each entrance. This includes both public entrances and those used by staff.We must also have “WET FLOOR” signs located by each entrance. Although this may seem obvious, small visual reminders go a long way. After we have located all of the tools we will need to help reduce slips and falls, it is time to develop a plan and communicate this plan to all staff. 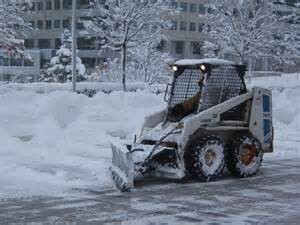 We must identify who is responsible for the removal of snow and spreading the ice melt? Is it only the custodial and maintenance staff or should others be included? What about after hour events and other activities? Who is responsible for our walkways and entrances during these functions? If we include others, we will need to provide proper safety instruction to them. In addition, we must make sure that everyone has the proper PPE (personal protective equipment). This may include: proper gloves for handling the ice melt, hearing protection, and eye protection. In addition, we must also provide instruction on the proper methods to spread ice melt. We have all been in places where there is so much ice melt it creates a slip and fall hazard. We must develop a plan to address the hall and entrances to our buildings. It is important that we keep up on wet floors and an accumulation of ice melt at our entrances. It may seem simple, but cold weather and black ice reminders are important. If we have staff who are responsible to work alone outside, we must have a procedure to “check up” on them. Consider providing “ice grips” to those who have the primary responsibility for removing the ice and snow. These are simple items to attach to the boots. We need to make sure there is adequate lighting for staff to work during the night or early morning. Finally, we need to train all staff responsible for snow removal in the proper use of the power equipment and vehicles used in the process. What triggers a snow or ice event? Will the contract service also spread ice melt or cinders? How often will they plow/treat the parking lot and sidewalks? Have you obtained a certificate of insurance for liability and work comp? Winter weather can and will create special slip and fall challenges. However with a little preparation, staff training and communication, we can hopefully avoid a serious injury.